Pasta served with a sauce is surely one of the most popular fast foods enjoyed the world over. This collection of recipes includes classics, plus some newer ideas, all inspired by authentic Italian ingredients now available all over the globe. Some sauces, such as Foaming Sage Butter take no time to prepare and involve little cooking. Others are richly flavoured but once prepared in advance, can simply be reheated to serve. 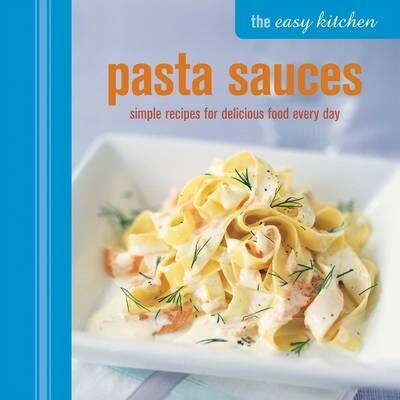 Classic recipes here include Ragu Meat Sauce from Bologna, plus Puttanesca, Carbonara and other familiar favourites. Ideas for budget-friendly vegetable sauces include a light and fresh Primavera; Roasted Aubergine and Tomato; and Courgette, Mint, Lemon and Cream. Fish and seafood options include Smoked Salmon, Creme Fraiche and Dill; Baby Clam with Tarragon and Cherry Tomatoes; and Monkfish with Olives and Capers. Rich and satisfying recipes for meat and poultry sauces include Meatballs in Tomato Sauce; and Herbed Chicken with Pancetta. Silky sauces rich with cream, eggs and cheese are perfect for occasional indulgence - try Ricotta, Cinnamon and Walnuts; or Parma Ham and Rocket with Bubbling Blue Cheese. Armed with a packet of dried pasta and this invaluable recipe book, you'll never be short of inspiration for a delicious and satisfying meal, whether dining alone or feeding hungry friends and family.